AutaBuild.com | Old Cars, Muscle Cars, Classic Cars, Sports Cars and More! Your ad will be posted immediately. • Learn about AutaBuild.com's RSS Feeds. AutaBuild is your Repairable Source Site! Save money and recycle a damaged vehicle. Many times you can buy a repairable vehicle and fix it yourself, allowing you to buy a newer vehicle at a much lower cost. View 1000s of listings on AutaBuild! Repairable dealers - Advertise Now! 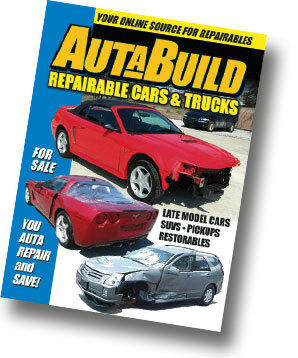 With the most comprehensive site online for repairables, AutaBuild Sells! for as little as $89.50 per month, you can list as many vehicles and parts as you want, which includes a simple and complete online inventory management system that you can login to at any time. Sell your Parts, Projects & Repairables. Private parties can list parts for sale for as little as .25 cents and use the AutaBuy Now Price or sell on auction to the highest bidder. More. Browse Dealers. Sell. Muscle Cars. Welcome to AutaBuild.com! Find 1000's of repairables and parts available for sale. Save money and buy a repairable vehicle. If you find a car you want, save it in My Garage. Repairable Dealers. For only $89.50 per month, list an unlimited number of automobiles online. More. List your parts and project cars for as little as .25 cents. No final selling fees. More. Check out the United States and Canada's Premier Full Color Buy Sell Trade automobile magazine and website with Muscle Cars, Classic Cars, Sports Cars, and Old Cars for sale.